The final series of Mr Selfridge, starting tonight at 9pm on ITV, plays out across period London, where the real man made and lost his fame and fortune. Camden, Islington, Lambeth, Southwark and Haringey have all provided backdrops, since filming began five years ago. The show was originally set in 1908, progressing through the decades from there. Tonight’s episode opens in 1928. Take a look at the trailer. Adapted from Lindy Woodhead’s biography Shopping, Seduction & Mr Selfridge – we already know that things are not going to end on a high note. FilmFixer manages the film office on behalf of the above London boroughs. The organisation’s director Karen Everett says, “A captivating period of London’s past is brought to life in Mr Selfridge’s sumptuous costumes and sets, met with a storyline adapted from fact. We’ve thoroughly enjoyed supporting the show from the start. “Londoners, who are still able to shop in the very store at the centre of this incredible story, have been extremely supportive in making the filming possible. “Residents, especially around St Martin’s Theatre, told us they really enjoyed watching the filming. 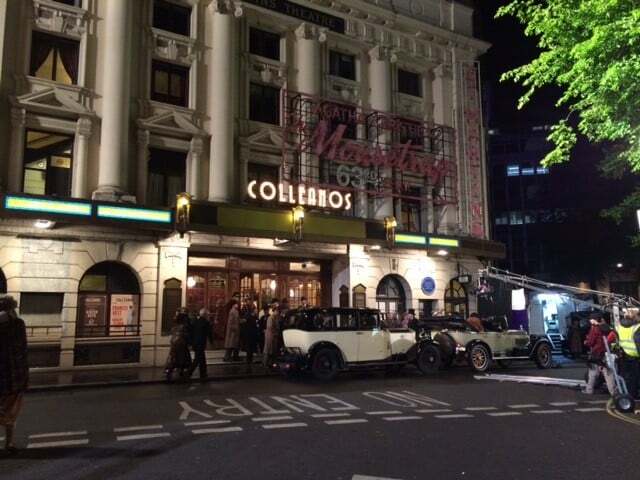 In May last year St Martin’s Theatre in the borough of Camden was converted into Victor Colleano’s new nightspot, bigger and more decadent than ever, seeing glamorous period cars pulling in and out along West Street. Filming on Camden’s Alexandra & Ainsworth Estate included Rowley Way, the underground garages, and Goldhurst Terrace, earning the Tenants and Residents Association a valuable fee. Bedford Row, Fairfax Place, Bea’s of Bloomsbury on Theobold Road and Spink on Southampton Row all feature. And there’s a violent flashback shot along Denmark Street, Flitcroft Street, Stacey Street and New Compton Street. In March last year, the filming moved to Stockwell Park Crescent in Lambeth. In January, Mystery Beauty on Broadway Parade in Haringey’s Crouch End, played a nail bar in the show. You’ll also see Southwark Bridge, Southwark’s Menier Gallery, Southwark Street and Redcross Way. And in December 2014 a key scene was filmed in Charterhouse Street in Islington. “The new series opens at a high-point in Mr Selfridge’s celebrity and influence,” adds Ms Everett. “His gambling and liaisons with show girls like the Dolly sisters, all of which was true, make for a great story. “By 1947 things have gone so wrong that he’s thrown out of his store.